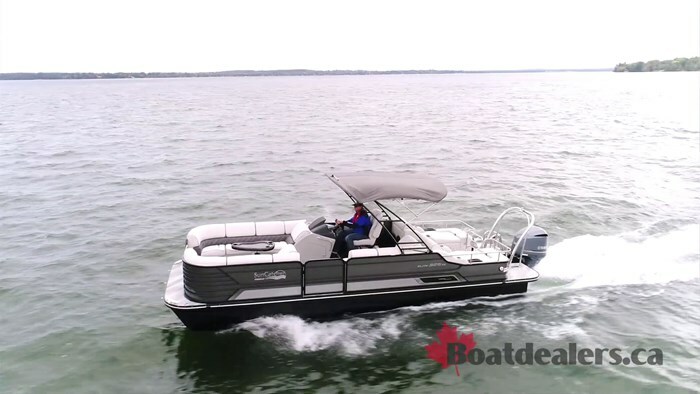 The Diamond Elite 326 SS is deservingly placed atop the SunCatcher line and it’s readily evident everywhere you look on this beautiful boat that G3 gave their engineers carte blanche on this design. She is a stunner at the docks, she’s beautiful in her interior and she plays on the water like a dream come true. 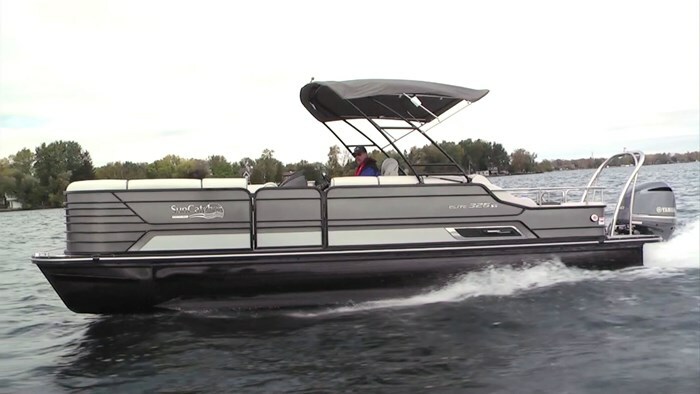 The black powder coated logs create a unique look on the water as opposed to the traditional galvanized logs on most pontoons. SunCatcher carries that look up onto the powder coated fence rails and the extensive fence rail design creates a beautiful finished look to the package. The powder coat takes one last run up and through the folding watersports tower. 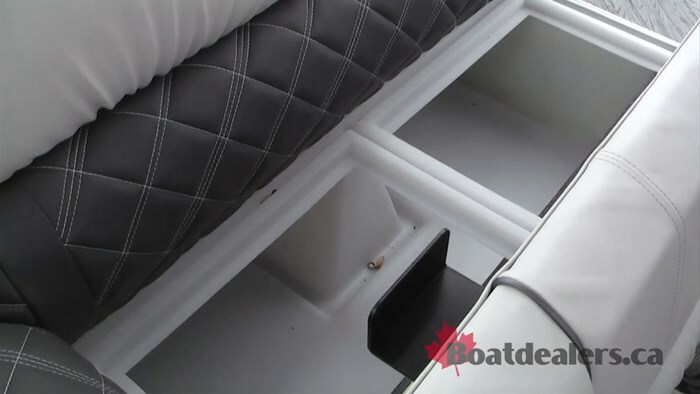 There are premium amenities to be found everywhere you look on this flagship model. 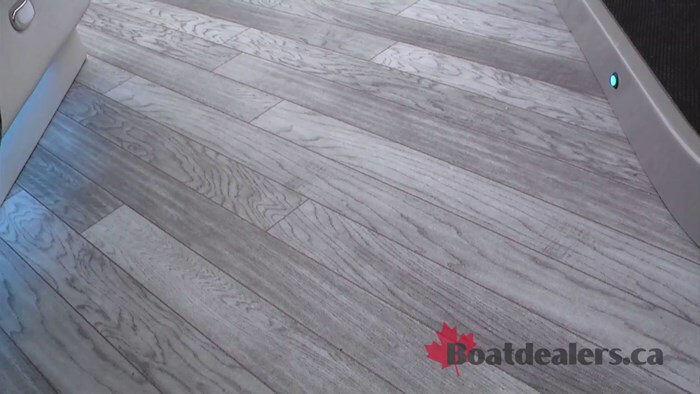 The flooring system is a very soft to the touch aqua tread weathered gray flooring – SunCatcher lays the flooring on a slanted installation which gives it a great look. The elegant furniture in the Diamond Elite series uses ultra-plush vinyl’s and SunCatcher trims it out with a double stitched, X pattern in the mid seat backs and head rests. 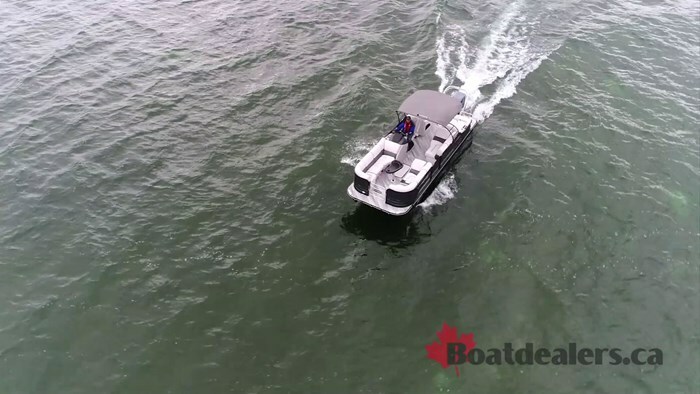 Like most upper end pontoons the Diamond Elite 326 SS features RGB lighting in the speakers, sub-woofer, flooring, cup holders, elevated helm station and throughout the cockpit as well as under deck illumination. Unique to this package is the ability to control your favourite lighting choice from a Bluetooth enabled app on your smart phone. 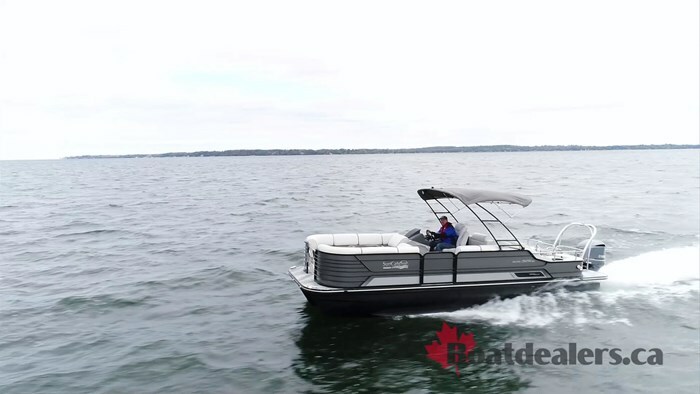 The elevated helm features an in dash premium Simrad touchscreen with a multitude of gauges and monitoring systems and Optimus electronic power steering. 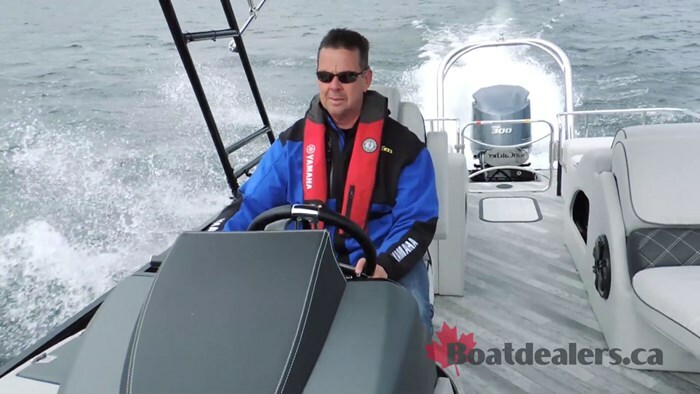 Sitting at the helm it was impossible not to appreciate the open feeling in the boat thanks in part to the beautifully designed stainless steel fence gates bow and aft. Both gates incorporate the SunCatcher logo tastefully sculpted in their layout. 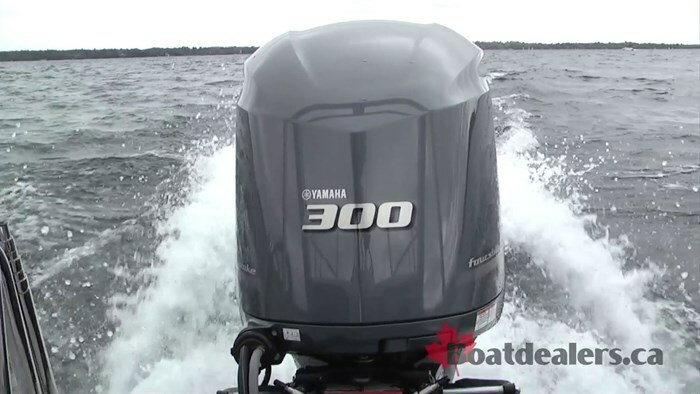 With a 300 HP Yamaha four stroke on the transom, a 3,480 lb dry weight on a 26’5” long by 8’6” wide body I was anxious to see how she would perform. On our rather cool and windy (choppy waters) test day the fuel tank was 80% full and with 2 big guys in the boat she leapt out of the hole and on step in 3.44 seconds. In no time at all the Diamond Elite 326SS found a top speed of 44.9 MPH at a perfect 6,000 RPM. 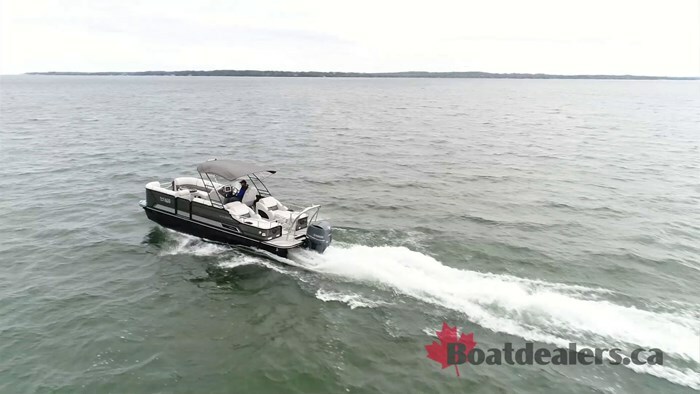 The true test of any boat is how she performs at a variety of cruising speeds – I found 23.3 & 26.2 to be particularly perfect in our test conditions. Any operator of this package could readily determine their favourite range based on the load they carry – with a 15-person capacity there’s lots of range and running options for this beauty. 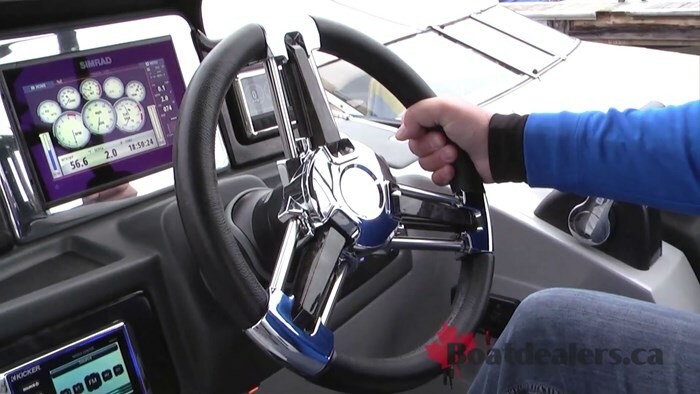 I absolutely loved the Optimus electronic power steering feature – regardless of speed or how hard I pushed the boat steering was truly effortless and in total control. 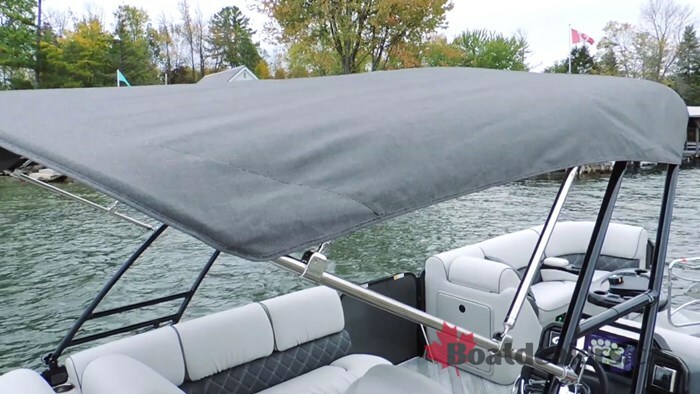 Consumers have a lot of options in pontoons today and manufacturers are continuing to create flagship models with exceptional designs and features. SunCatcher is part of the G3 family which is owned by Yamaha and clearly SunCatcher is making a very strong statement here. 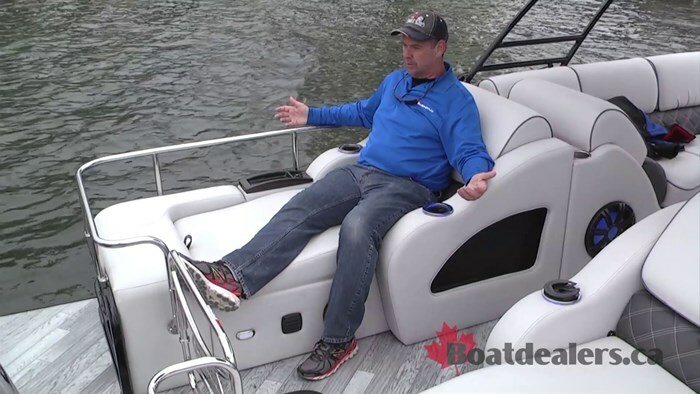 The Diamond Elite 326 SS is a marvelous package with something for everyone and would be a proud addition to any family or dock.